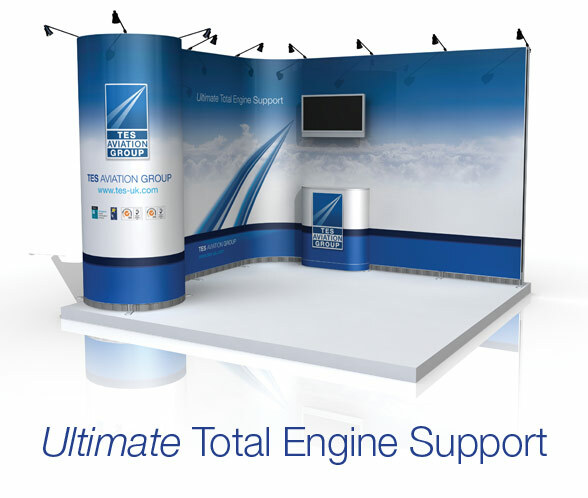 In a high value market, providing maintenance and support for jet engines, TES Aviation Group had found that their exhibition stand was not only very bulky to transport around the world, but that it didn’t reflect the quality of their service. With the ever increasing cost of exhibition space, it was vital that a new system and supporting graphics were as flexible as possible and designed to last well into the future. An additional challenge was that a 32” monitor needed to be incorporated into the new exhibition system, so strength in structure was paramount. Having plenty of experience specifying and producing exhibition systems for clients, we were confident that we could deliver on all the challenges of this project. We produced an exhibition system that offered considerable format flexibility, and that had the necessary strength to support the 32” monitor. The graphics had to work in harmony with the flexibility of the system, as well as provide a more conceptual background design, removing the need to update regularly with copy changes. The final part of the solution was ensuring that this investment remained protected during transit, so we incorporated a wheeled flight case that could be placed on a pallet and flown worldwide. TES Aviation Group now have an exhibition system that truly reflects the high quality of their brand, as well as a more efficient method for global transportation. The flexibility of the exhibition stand ensures that spend can be minimised on exhibition space and also the design of the graphic ensures a lengthened lifetime value.